0.1 Yobe State University, YSU Damaturu first and second Academic Calendar for the 2018/2019 Academic Session has been published online, all students of the institution should take note. 1 YSU First Semester Academic Calendar. 2 Second Semester Academic Calendar. 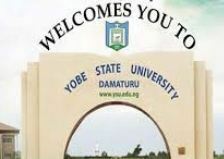 Yobe State University, YSU Damaturu first and second Academic Calendar for the 2018/2019 Academic Session has been published online, all students of the institution should take note. This is to bring to the notice of all students of Yobe State University (YSU), Damaturu that the management of the institution have released the academic calendar for the first and second semester 2018/2019 academic session. Below is the Academic activities for the session. YSU First Semester Academic Calendar. All Mobile users should endeavor to scroll left and right to enable them view properly. Student Should take note that all public holidays are to be observed accordingly as announced. Please Click On The Facebook Share Button And Share With Friends.